Yesterday we were talking about the luscious, glossy lips. Todays topic is The Velvety Matte Lips. The matte lips can be tricky. 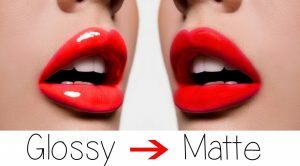 Because if your lips are dry and cracked the matte lipstick will look really bad and cheap. The same rules are on when you are prepping the lips for the matte lipstick. apply lipliner! Its essential, because it defines the lips, you can be more precise and making your lipstick long lasting. fill up the lips with your matte lipstick. Use a lip brush in this case you will be more precise with lines and the lipstick will look rich and full. Also the lipstick will last more longer. Do long and clean strokes with your lip brush. The texture of the matte lipsticks are more dry then the creamy ones its obvious because of the matte finish. We can suggest you the new Kryolan Matte Lipsticks. They are giving you the perfect matte velvety finish but at the same time the texture is not so dry. Now its time to get on practicing. The more you practice the better you will be in application the right lipstick colour and your lips will be perfectly defined. Thank you guys in tuning in! Tomorrow we will talk about ombre lips stay with us to know more tips and tricks!